Young Socialist posters from the early 1980's. Building support among young people has always been a feature of socialist activity in Ireland. These represent the early days of this work in N Ireland from 1979. Marxists have allways seen a real importance in building support among young people. In 1979 Militant saw the need to try to build a youth section, and this led to the emergence of the youth for socialism campaign, which led in turn to the Young Socialists. 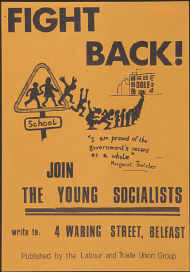 A viable youth organisation was built and it was renamed as the Young Socialists. The YS produced this general poster to campaign against the high levels of youth unemployment under the conservative Thatcher regime. 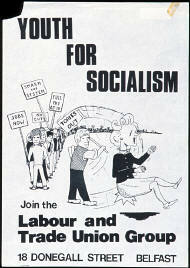 The poster was adapted from an original cartoon by Alan Hardman, of the British Militant newspaper.